We’d love your help. Let us know what’s wrong with this preview of Horseradish by Lemony Snicket. Life is a turbulent journey . This book will not help you . Lots of inescapable truths by Lemony Snicket. To ask other readers questions about Horseradish, please sign up. Stella Woodbury Daniel Handler but his pen name is Lemony Snicket! Are these all new, original aphorisms, or are some from A Series of Unfortunate Events? Stefanie A lot of them are new I believe! Oh my goodness, I loved this so much. It's full of brilliant little snippets of snicket's hilarious and beautiful writing. If you're a fan of Lemony Snicket, this is a must read. When I first saw this book, I thought to myself, "What a waste. It's one of those silly quote books, with at most a paragraph a page. Harumph." Yet once I was half-way through, I found myself thinking, "Every kid needs to know these things, preferably with as little pain as possible. This book is that painless means by which one may inform them, gently, of the inherent unfairness and occasional joys of life." By the time I was finished, I wished I could hop into a time machine, travel back in ti When I first saw this book, I thought to myself, "What a waste. It's one of those silly quote books, with at most a paragraph a page. Harumph." Yet once I was half-way through, I found myself thinking, "Every kid needs to know these things, preferably with as little pain as possible. This book is that painless means by which one may inform them, gently, of the inherent unfairness and occasional joys of life." By the time I was finished, I wished I could hop into a time machine, travel back in time, and hand my younger, now-terrified, -confused, and -somewhat disappointed self this book with instructions to read it and take its wisdom to heart, in spite of it being one of those quote-a-page books. Of course, once she did, this current self would disappear, to be replaced by a less-emotionally-scarred version, one who would not necessarily be motivated to find the time machine and hand her younger self this book, so that her younger self never reads it, so that unscarred-me never exists, yet I come into being, read this book, jump back in time to give it to my younger self, and continue this looping series of paradoxes which eventually lead to the destruction of the very fabric of space and time itself. In spite of the dangers to the universe this book has potential to create, I still give it five stars, with a caveat not to use a time machine to enlighten your younger self less painfully. This book is full of very short snippets of Snicket wonderfulness. It took me about 1 hour to read, and that was with me stopping to giggle and interrupt my friend (who was also reading) every 3 minutes to read aloud something. Very funny, very insightful. I think anyone with a twisted sense of what is wonderful and terrible will enjoy this. This book will not help. …or at least, that's what the blurb reads. I think this exactly the sort of book it's nice to have around when you're down and struggling with life's inherent unfairness. Horseradish: Bitter Truths You Can't Avoid is a compilation of quotes from A Series of Unfortunate Events, Lemony Snicket, the Unauthorized Autobiography, and The Beatrice Letters and I am ecstatic to have finally gotten my hands on it. Years ago, I read somewhere between 7-10 books of A Series of Unfortunate Events and I loved Snicket's writing style and his twisted, irreverent sense of humor, I just couldn't enjoy the series the way I wanted to. I think it was my extreme lack of patience. I don't mind the odd children's book, but I really would have liked to just bottle the moments of brilliance that were keeping me reading and cut out the rest- this is that bottle. What we're left with is a brilliant, much more universally appealing book, I think. While some of this was more common sense, a lot of these were kind of wake up calls and others were just funny. They carry that same sense of doom that all of Snicket's words seem to convey, which I loved. There was just something about this, it was a quick read but I still felt enlightened despite having already known and experienced most of these things (which may be why I loved it even more). He also described some things so perfectly, I just couldn't help but love this little collec 4.5 STARS! Recommends it for: anyone who enjoyed Lemony Snicket's random quotes in A Series of Unfortunate Events. This book is hilarious! It has many random bits from the Series of Unfortunate events. I think this book would make a great book for the coffee table, because you could open it up and giggle at it without having to read a whole story. I just recently read the series of unfortunate events and it was fun to find quotes that I had read aloud to my roommate. "If an optimist had his left arm chewed off by an alligator, he might say in a pleasant and hopeful voice, "Well this isn't to bad, I don't have a left arm anymore but at least nobody will ever ask me if I'm left-handed or right-handed" but most of us would say something more along the lines of "Aaaaaa! My arm! My arm!" I actually started this book a while back and couldn't get into it. However, in cleaning off my desk I saw that it had a bookmark in it, indicating that I wasn't that far. So, I picked it up again today. It's not a story, so don't go into it thinking you will get a tale. However, it has some great little quotes, some serious. Some humorous. Because of this, I was able to enjoy it. For example, I really liked "Everyone should be able to do one card trick, tell two jokes, and reci I actually started this book a while back and couldn't get into it. However, in cleaning off my desk I saw that it had a bookmark in it, indicating that I wasn't that far. So, I picked it up again today. It's not a story, so don't go into it thinking you will get a tale. However, it has some great little quotes, some serious. Some humorous. Because of this, I was able to enjoy it. For example, I really liked "Everyone should be able to do one card trick, tell two jokes, and recite three poems, in case they are ever trapped in an elevator." See--enjoyable. But again, not a story, so don't go into it thinking you have this tale that will transpire. This is not a meal that has been prepared for you to enjoy. Instead, it is a supermarket that has opened its aisles and allowed you to pick and choose what you would like to take home. Back in elementary school I had a huge love for the Series of Unfortunate Events by Lemony Snicket, I would read these books over and over again and once I had read the whole series over and over again I finally pushed the books aside and moved onto bigger and better things. 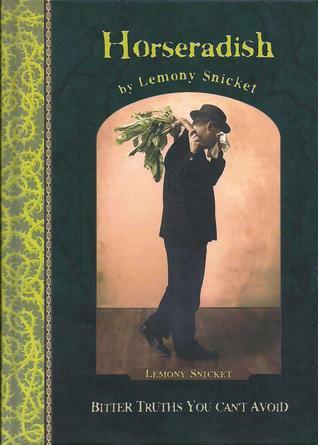 However, the other day when I was going through a pile of $1.00 books in an old book store I came across this book by Lemony Snicket, quickly a feeling of nostalgia came over me and I was forced to run to the clerk and purch Back in elementary school I had a huge love for the Series of Unfortunate Events by Lemony Snicket, I would read these books over and over again and once I had read the whole series over and over again I finally pushed the books aside and moved onto bigger and better things. However, the other day when I was going through a pile of $1.00 books in an old book store I came across this book by Lemony Snicket, quickly a feeling of nostalgia came over me and I was forced to run to the clerk and purchase the book. As soon as I came home, I flipped open the book and read it from cover to cover. Once I was finished I reached a consensus, it was great. Lemony Snicket had created his shortest and greatest little novel yet. Basically, the book was just a slightly under 200 page book with, "Bitter truths you cant avoid." Each page contained a thing that Lemony Snicket to believe a fact that he wished to share with the world. Though some of his "truths" are really quite ridiculous and some pointless a lot of amazing quotes lie within that book. The book is divided into sections like: Home, Travel, Affairs of the Heart. There are many funny quotes in here although there are also some that make you really think, there are even a few that may draw a tear from your eye, which is something I love about this book. I actually liked this book a lot more than I thought I would! I thought that there novel was very witty and creative. I laughed a lot and got confused on only a few things. You do have to have a sense of humor to get it, as I was told by the person who recommended it to me. I would recommend this! Full of amazing, witty quotes and pieces of writing that make you happier having read them. Written in Lemony Snicket's unique voice, this book may not take you long to read through eagerly, but the words make you think about how you are living your life. I truly love this author. One of the remarkable things about love is that, despite very irritating people writing poems and songs about how pleasant it is, it really is quite pleasant. Love can change a person the way a parent can change a baby--awkwardly, and often with a great deal of mess. Everybody will die, of course, sooner or later. Circus performers will die, and clarinet experts will die, and you and I will die, and there might be a person who lives on your block, right now, who is looking both ways before he crosses the street and who will die in just a few seconds, all because of a bus. Everybody will die, but very few people want to be reminded of that fact. Deciding on the right thing to do in a situation is a bit like deciding on the right thing to wear to a party. It is easy to decide on what is wrong to wear to a party, such as deep-sea diving equipment or a pair of large pillows, but deciding what is right is much trickier. The truth is that you can never be sure if you have decided on the right thing until the party is over, and by then it is too late to go back and change your mind, which is why the world is filled with people doing terrible things and wearing ugly clothing. Read 95% of the book with a smile on my face. Snicket is rare, wonderful, and refreshing!! It is one of life's bitterest truths that bedtime so often arrives just when things are really getting intere Read 95% of the book with a smile on my face. Snicket is rare, wonderful, and refreshing!! A good library will never be too neat, or too dusty, because somebody will always be in it, taking books off the shelves and staying up late to read them. A library is like an island in the middle of a vast sea of ignorance, particularly if the library is very tall and the surrounding area has been flooded. "It is a curious thing, the death of a loved one. We all know that our time in this world is limited, and that eventually all of us will end up underneath some sheet, never to wake up. And yet it is always a surprise when it happens to someone you know. It is like walking up the stairs to your bedroom in the dark, and thinking there is one more stair than there is. Your foot falls down, through the air, and there is sickly moment of dark surprise as you try and readjust the way you thought of things." This one obviously stood out among the others, with its simply clean cover and of course, the interesting title. I picked it up to find out more. It didn't take very long to read through the entire book. With chapters laid out on different aspects of one's life (Family, Home, School, Work, etc. ), it was interesting to think about the author's life and where his lessons stemmed from. I'm on to his autobiography next. This is a great gift book for that person in your life who has been there, done that, seen it all, and yet still, somehow, is able to laugh at life and all its bitterness. Life is a turbulent journey, fraught with confusion, heartbreak, and inconvenience. This book is wonderful (or should I say terrible?) in typical Lemony Snicket fashion. Broken up into segments such as "School," "Literature," "Family," and "An Overall Feeling of Doom that One Cannot Ever Escape No Matter What One Does," Snicket offers short anecdotes meant to... what? Inspire? Depress? Amuse? I suppose they do all three in turn. This is the perfect book for fans of A Series of Unfortunate Events who are hankering for more Snicket even though the series has ended. I suppose it's This book is wonderful (or should I say terrible?) in typical Lemony Snicket fashion. Broken up into segments such as "School," "Literature," "Family," and "An Overall Feeling of Doom that One Cannot Ever Escape No Matter What One Does," Snicket offers short anecdotes meant to... what? Inspire? Depress? Amuse? This is the perfect book for fans of A Series of Unfortunate Events who are hankering for more Snicket even though the series has ended. I suppose it's akin to Rowling's Beedle the Bard in that way. Although Horseradish doesn't mention any characters from Unfortunate Events, I would still consider it to be a companion book if only because Daniel Handler has made Lemony Snicket into a character in his own right. "What happens in a certain place can stain your feelings for that location, just as ink can stain a white sheet. You can wash it, and wash it, and still never forget what has transpired, a word which here means "happened and made everybody sad." "It is one of life's bitterest truths that bedtime so often arrives just when things are getting interesting." "It is often difficult to admit that someone you love is not perfect, or to consider aspects of a person that are less than admirable." "It is very difficult to make one's way in this world without being wicked at one time or another, when the world's way is so wicked to begin with." "One cannot spend forever sitting and solving the mysteries of one's history." I chose to read "Horseradish" in part because of the hilarious cover and in part because I've heard so many great things about Snicket (and loved his picture book,The Composer Is Dead) but his Series of Unfortunate Events has never really appealed to me. This is supposedly a "bouquet of alarming but inescapable truths [from Snicket's work:] along with selections from his unpublished papers and remarks he has made at dinner parties and anarchist riots, in order to remind the reader that even the I chose to read "Horseradish" in part because of the hilarious cover and in part because I've heard so many great things about Snicket (and loved his picture book,The Composer Is Dead) but his Series of Unfortunate Events has never really appealed to me. This is supposedly a "bouquet of alarming but inescapable truths [from Snicket's work:] along with selections from his unpublished papers and remarks he has made at dinner parties and anarchist riots, in order to remind the reader that even the loftiest of inspirations contains a sharp, bitter kernel of dread--and vice versa." Most of the quotes were really not so alarming as that, although there was a good deal of Gloom interspersed with the amusing. I tend not to gravitate toward Gloomy so I am probably not the target audience for this, but it still made for (largely) entertaining and enjoyable reading during a few lunch breaks. However, I am not sure I would recommend purchase (it can be read in less than an hour!) unless you are a die-hard Snicket fan--and even then perhaps most of this is stuff you've already read, I don't know how much is borrowed and how much is new. There is a short story in the Introduction that is, I assume, written for this book. I'm awarding this only three stars because I was generally amused by the quotes but found some rather tedious, rambling and repetitive or just plan unoriginal. (Then, too, I wasn't a fan of the Gloomiest ones) Here is a sampling of the good, the bad, and the Gloomy--you can decide among them. "The quoting of an aphorism, like the angry barking of a dog or the small of overcooked broccoli, rarely indicates that something helpful is about to happen." "One wanders through life as if wandering through a field in the dark of night, wearing a blindfold and very heavy shoes, with a poisonous toad waiting patiently beneath a clump of weeds, knowing full well that eventually you will step on him." "Labor Day is a holiday honoring those who work for a living. Laborious Day is a lesser known holiday honoring those who cannot stop talking about their work." I think that Lemony Snicket’s advice about putting cats in your mouth if you’re allergic – don’t do it – is excellent. That is all I have to say about this book. It turns out, this is really not even a book. It's just a bunch of pages with quick paragraphs or sentences bound together. The whole idea of this book is to present advice in a witty or humorous way. But it isn't really all that witty or humorous, because the author's just using a schtick. You know what, I can make another entry just like it out of the template he kept using: "Taking Physics is just like having a car accident. You're in utter terror throughout the whole experience and ultimatel It turns out, this is really not even a book. It's just a bunch of pages with quick paragraphs or sentences bound together. The whole idea of this book is to present advice in a witty or humorous way. But it isn't really all that witty or humorous, because the author's just using a schtick. You know what, I can make another entry just like it out of the template he kept using: "Taking Physics is just like having a car accident. You're in utter terror throughout the whole experience and ultimately everything crashes into a huge implosion." I mean, it's not great, and I acknowledge Handler/Snicket did a better job at it. But I didn't want to read 100+ entries of these. I was not entertained in the slightest. His whole intention is to be charming, but I wasn't charmed, I was annoyed. All of the advice was very obvious as well. I gained nothing from this reading experience. I adore Lemony Snicket. A Series of Unfortunate Events was my favourite series when I was a kid - it’s still one of my favourites now. I’ve wanted to read this book for so long and I was so excited to finally get my hands on a second-hand copy. It’s been one of the most enjoyable reading experiences I’ve had in a while. Horseradish is a wonderful little book full of typical Lemony Snicket awesomeness. It’s so quotable - really, anything by him is. It’s split into sections on education, work, literature, etc. so there’s something for everyone. Some of the snippets will make you laugh, others will make you think, others you can relate to and some are just plain odd. Great fun! This is a charming and depressing book of quotes about some of the bitter truths of life. Some of these quotes I recognized from his unfortunate series but others are twisted truths and gloomy observations of common expressions. Like, "There are some people who believe that home is where one hangs one's hat, but these people tend to live in closets and on little pegs." I particularly liked the quotes about reading and libraries. For example: "A library is like an island in the middle o Great fun! This is a charming and depressing book of quotes about some of the bitter truths of life. Some of these quotes I recognized from his unfortunate series but others are twisted truths and gloomy observations of common expressions. Like, "There are some people who believe that home is where one hangs one's hat, but these people tend to live in closets and on little pegs." I found this at a library sale for $1 when I hadn't had the greatest of days. I opened it up twice, at random, and landed on the two quotes I shared on my status updates, clinching the purchase. If you've read "A Series of Unfortunate Events," some of this might seem superfluous, but if you don't know Lemony Snicket, some of those same quotes are going to seem completely off-the-wall. And, yet, there are some quotes (including one about aphorisms at the end) that I think would've made me chuckle I found this at a library sale for $1 when I hadn't had the greatest of days. I opened it up twice, at random, and landed on the two quotes I shared on my status updates, clinching the purchase. "If writers wrote as carelessly as some people talk, then adhadh asdglaseuyt[bn[ pasdlgkhasdfasdf"
"In times of extreme stress one can often find energy hidden in even the most exhausted areas of the body." This little book that took me 30 minutes to read, if that, is one that I know I'll buy because every page is perfection. I completely forgot to mention that I re-read this little gem of wisdom over the weekend. Funny enough it actually did quite a bit to uplift an otherwise dreary mood. I think it might be one of those books I should read yearly, like Love That Dog (Actually maybe I should go and re-read that one now!) as it is one of those that gives far more than it takes. Thanks Mr. Snicket, sir. You have served me well once more. If you like Lemony Snicket, you'll enjoy this book. If you have stitches in your lip, it will be somewhat painful to read this book as it will be difficult to not laugh or smile. Please wait until you are all healed. And by "healed" we mean "no longer having stitches in your lip." 'Horseradish' is an excellent name for the book; bitter truths indeed. Funny, and worth reading (especially to your angsty 12-year old girl or 14-year old boy), but bitter. Well that was one of the most bizarre books I have ever read. I generally love out there humor and this didn't disappoint. There were many pages (although not enough) of dry humor, but I also really enjoyed that hidden within the humor was sometimes profoundly sound advice. : I keep going back and rereading pages of this book. Some of them are sweet and thought-provoking and others are just really funny.